The Lowest Stemmons Project is bringing a much needed upgrade to a 3.4 mile portion of 35 in the city of Dallas. With 240,000 cars a day, and infrastructure that is long obsolete, this section of freeway is in desperate need for an upgrade. This section of freeway has not been reconfigured since it was built in the late 1950s. 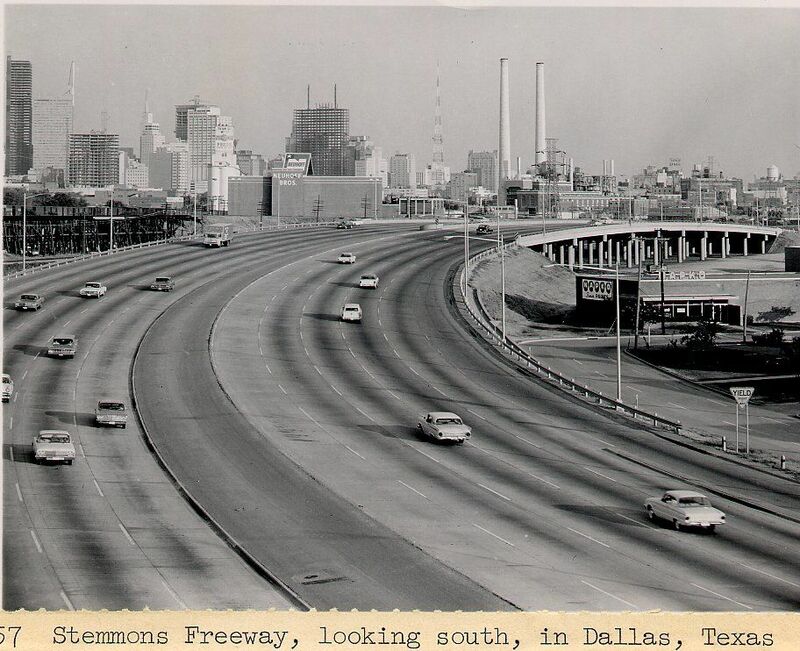 Here is a photograph of the section of freeway in 1960. Notice how it is comparatively the same today. On the TxDot Letting Schedule you used to be able to see all of the money allocated to the project but now all I can find between 2014-2018 in the Dallas District for this project is $70 million for this portion of the project. There are improvements that have been started in "Lower Stemmons" from Oak Lawn Avenue to SH 183 as well. It looks like they will be reconfiguring the ramps and also the dangerous SH 183 EB to 35E SB center lane merge. Here is something, looks like a fairly typical freeway widening project that promises to alleviate congestion but probably won't. Tnexster wrote: Here is something, looks like a fairly typical freeway widening project that promises to alleviate congestion but probably won't. More highway lanes.... wonderful.... UGH. I'm all for cleaning up 35 and making it more modern and appealing but it's already a huge scar right through our city and riverfront. No need to make the scar larger. Invest in more public transit to take some of those cars off the road. I was probably being too optimistic, but I was really hoping for a little more creativity that might benefit the urban core. I would have loved to see portions of this interstate buried to help better connect the Design District and Victory Park. I realize this is probably an extremely costly endeavor, and, even if you were to bury all of I-35, you'd still have the rail tracks, DNT, and Harry Hines Blvd acting as barriers, but you have to start somewhere. I'd much rather see efforts to hide existing highways in this area, rather than trying to build a ridiculous bridge to connect the Katy Trail to the Trinity Trail. I figured I was being way too unrealistic in my expectations though. I'm sure decking any of this would be extremely complicated and costly, and, no matter what happens to I-35, the surrounding area will still thrive and boom regardless, so the city doesn't really have much of an incentive to spend extra money trying to beautify the area. A deck park makes sense when it's an up and coming area that needs a bit of help developing, but Victory Park is just about built out, and Design District will get there eventually too without any sort of public projects to help them get there. It would be difficult to do a sinking/below-grade of I-35E, especially this part, with Turtle Creek and other streams crossing it and nearby. I hope Reverchon Park and Turtle Creek get a boost out of this highway reconstruction. Reworking the confluence of Harry Hines, Tollway and I-35 should daylight the creek to the Design District, improve traffic flow into the downtown area AND increase the size and appeal of the park -- less expensive than a touted deck park. Keep in mind this was planned as a bare-bones project because there is sharp disagreement about how to solve the traffic problems on 35. Originally for the past 20 yrs, TxDOT was telling the city there was no way to improve this section of the freeway without building the Trinity River Tollway. They said multiple times any construction on 35 to solve hang-ups would have to have start once the Trinity Tollway was built and operating. The full Pegasus project planned to spend millions on beautification at intersections and landscaping once the Trinity Tollway was in operation. Once TxDOT got the clear indicator that the Trinity Tollway wasn't looking like a winner anymore they looked at how can we make more surgical changes to improve flow without requiring a total rebuild of 35. Here we are with the impossible that the city requested from the start. I thought this message was coming from the city's backers of the tollway. TxDOT position being the reconstruction will happen with or without the tollway. tamtagon wrote: I hope Reverchon Park and Turtle Creek get a boost out of this highway reconstruction. Reworking the confluence of Harry Hines, Tollway and I-35 should daylight the creek to the Design District, improve traffic flow into the downtown area AND increase the size and appeal of the park -- less expensive than a touted deck park. Yeah, that's basically what I was trying to get at. It doesn't necessarily have to be a 'deck park', but the highways here should be designed to enhance the greenspace around it. One little known part of this project: The entrance from northbound 35E to the DNT will be moved south of Spur 366 (Woodall Rodgers). There will no longer be direct freeway access from westbound 366 to the DNT -- you'll have to cut through Uptown on Pearl or Griffin. Hannibal Lecter wrote: One little known part of this project: The entrance from northbound 35E to the DNT will be moved south of Spur 366 (Woodall Rodgers). There will no longer be direct freeway access from westbound 366 to the DNT -- you'll have to cut through Uptown on Pearl or Griffin. I didn't realize that before. That will be interesting to see. No more fighting/weaving traffic from Woodall Rodgers mixing with those going to the Tollway. I guess those coming up from EB/WB I-30 will have some advantage of getting on the Tollway directly, otherwise, it'll be a get-off-at-Oak-Lawn group of folks trying to get on the Tollway that way. Yes and no. It depends on who you ask and what stage of the lie the DMN was willing to participate in before they had that awakening and realized Leppert wasn't being honest with what government planning officials were saying. so is this "fix" a temporary stop gap for TxDot or is this the re-do that replaces Project Pegasus altogether? My best guess and it is a guess is that is an improvement from TXDOT's point of view and allow them to delay a bigger project once the results of these changes set in. Who on earth would be going from WB 366 to the DNT? At any time of day, McKinnon would be the same or faster from any point along 366, and travelers from north or east of the 366/345 interchange would be seriously back-tracking by going to the DNT via 366. ^ I just checked the travel time from Deep Ellum to the intersection of DNT and Oak Lawn Avenue, using Google maps. Three minutes faster using 366-35E-DNT than surface streets. Hannibal Lecter wrote: ^ I just checked the travel time from Deep Ellum to the intersection of DNT and Oak Lawn Avenue, using Google maps. Three minutes faster using 366-35E-DNT than surface streets. So it's 3 minutes faster in the best case (using highways is always going to take longer than surface streets at AM/PM rush hour) and still requires an extra mile and a half of driving over the Pearl/McKinnon option for an edge case scenario. I'm not a highway tear-out extremist, but people need to be practical about picking a route from Point A to Point B. Maybe getting on the highway saves the hypothetical Deep Ellum-DNT commuter a few minutes, but at the expense of far more drivers making longer trips (who now have to contend with an additional vehicle merging or weaving 3-5 times in a 4 mile trip). Unless the freeways are wide open, that's going to have a bigger ripple effect than an additional car entering an arterial street. Public transport doesn't help me as I "drive" through Dallas. The 183 interchange merging south is a big problem. Especially the left lane of 183 merges with I35's right lane. Surely TxDot must have known this for years. The new ramps along Stemmons will be a lot taller than I expected. Many of the columns are pretty tall in spots. Hopefully, it won’t look like the elevated express lanes further north on Stemmons. The express lanes look awful! dallaz wrote: The new ramps along Stemmons will be a lot taller than I expected. Many of the columns are pretty tall in spots. Hopefully, it won’t look like the elevated express lanes further north on Stemmons. The express lanes look awful! Yikes, I have not seen that yet. Where along Stemmons are we talking? South of Woodall or north? Looks like it is going to mess up the view from the Cabana Hotel project. I know it would have been a boat load of work & money, and also presented challenges due to historic trinity river channel, but I would have preferred that any rework of freeways within a couple of miles of the CBD be trenched (similar to 75) allowing various points to be capped over time. These concrete monstrosities are nearly impossible to mitigate. It's not as bad as north Stemmons but it's still elevated and will be there for a long time.